In episode #4, Yvonne and Shamash talk to Emma Slade about how she went from being a high-powered banker travelling the world, to a Buddhist Nun and founder of a charity working in Asia. We would value your review. Please leave a review on iTunes. Thanks! In episode #3, Yvonne and Shamash talk to Nick Williams about how he found the work he was born to do, overcoming resistance, working with your shadows, a new definition of leadership and the importance of showing up everyday, doing and sharing your unique gift and talent. 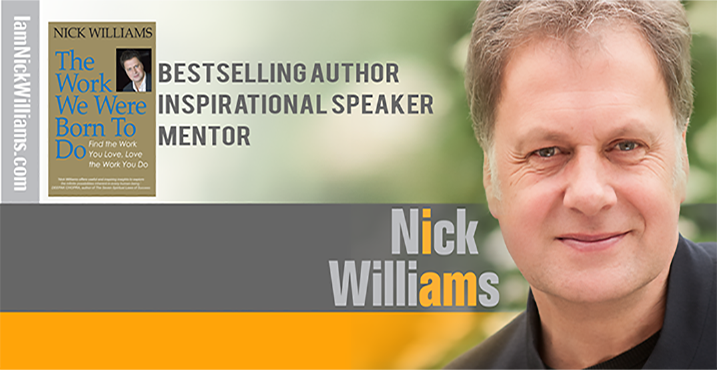 Nick is a coach, trainer and author of over 10 books, including the bestselling 'The Work You Were Born To Do'. Nick has spoken at events around the world, created communities that support each other in sharing what they love and shares his wisdom daily with his audience. - How and why he writes about resistance, and ways to work with resistance through understanding and self-compassion. In episode #2, Yvonne and Shamash talk to Susy Paisley about applying a love for nature conservation into selling nature-inspired designs, and the joys and difficulties of the journey. Susy is a conservation biologist and founder of Newton Paisley. Newton Paisley creates beautiful and unique fabrics and wallpapers, all designed and hand-drawn by Susy. Each design tells stories of neglected and endangered species, and, even better, contributes towards the preservation of critical wild habitat. For every every metre of fabric sold, 100m2 of wild habitat is preserved through our collaboration with World Land Trust. Please share and leave a review of our podcast. Thanks for listening to our first episode! In this first ever episode, you get to meet the hosts of the Zen of Business Podcast, Yvonne Fuchs and Shamash Alidina. Tune in to find out how Yvonne and Shamash met, what experience they're bringing to this podcast and what Zen of Business means for them. Every month, they will be interviewing business owners who they believe bring Zen to their business in a variety of different ways. Leave some feedback. Please do get in touch to let us know who you'd like us to interview next, and what you're like to learn about. Enjoyed the show? If so, please leave a short review on iTunes. Thanks.